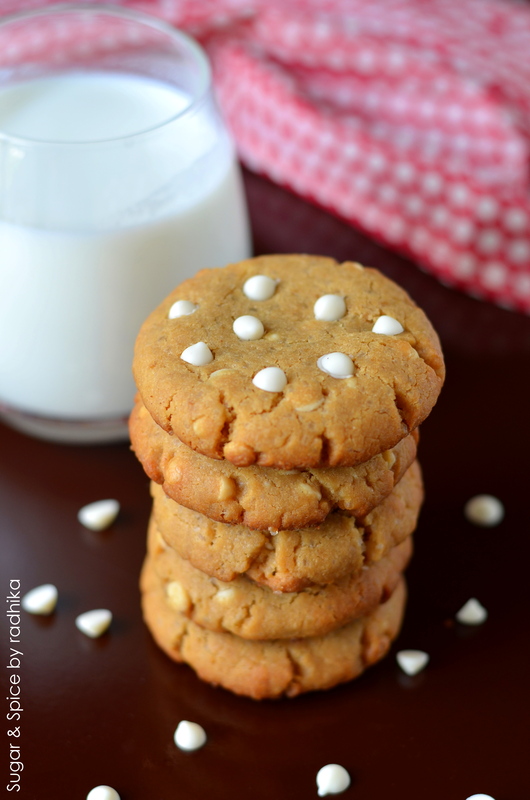 These super soft Peanut Butter cookies with lots and lots of white chocolate chips are enough to satisfy your PB cravings and are easy to make too! 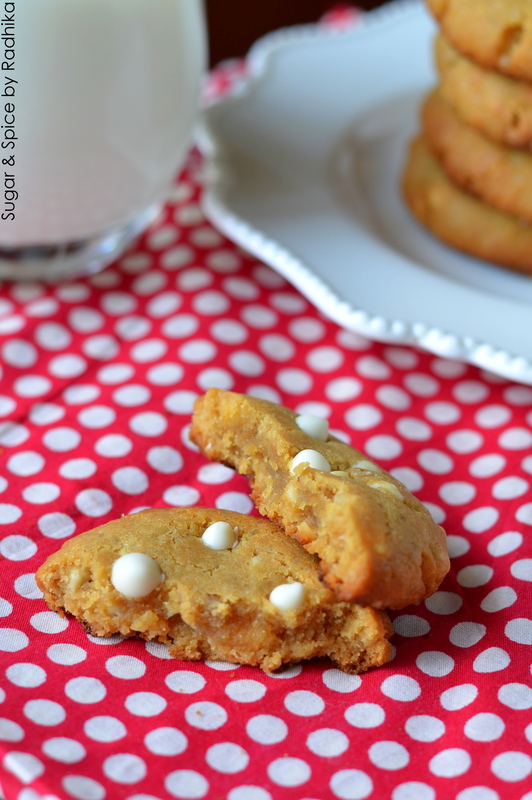 If you love peanut butter you have got to try these soft Peanut Butter White Chocolate Chip Cookies..! I’ve been getting PB craving recently and after having my Peanut Butter Swirl Brownies all I could think of was ways to incorporate peanut butter in my baking so I baked these. 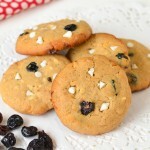 These cookies are really soft and also easy to make. 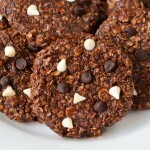 These cookies unlike my other cookie recipes aren’t super duper soft but are somewhere between crunchy and soft. You get a little crunch when you bite into these and I loved that ! 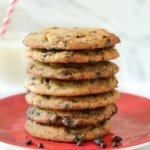 Great change from super soft cookies. 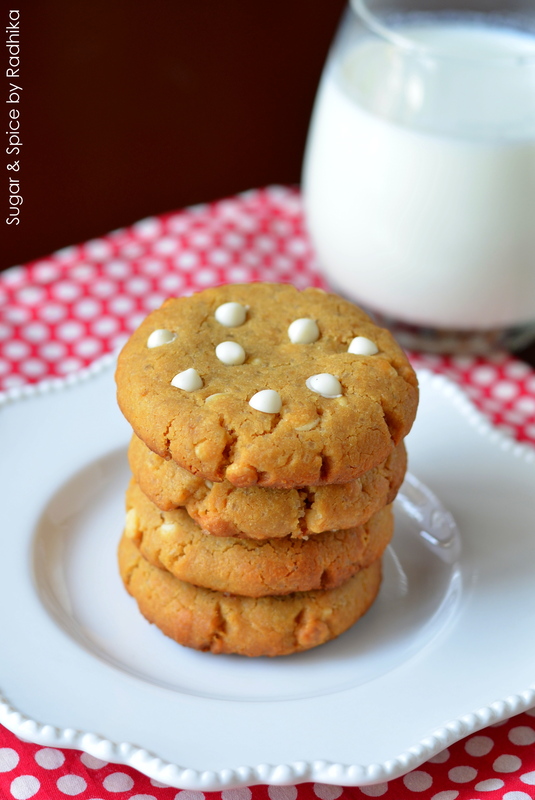 I’ve used creamy peanut butter to make these and I keep wondering what these would taste like had I used the crunchy one! 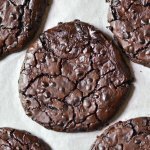 Let me know if you’ve ever tried those..To add the peanut butter to the recipe I reduced the butter from 1/2 cup (what i normally add) to 1/3 of a cup to not go overboard with fat contents so they’re healthy..in a way 😉 Dense chewy cookies, they could easily fail any peanut butter cookie you’ve ever had. Egg, 1 at room temp. Sift together flour and baking powder and keep aside to be used later. In a separate bowl, Whisk butter until light in color and fluffy and add in the sugars. 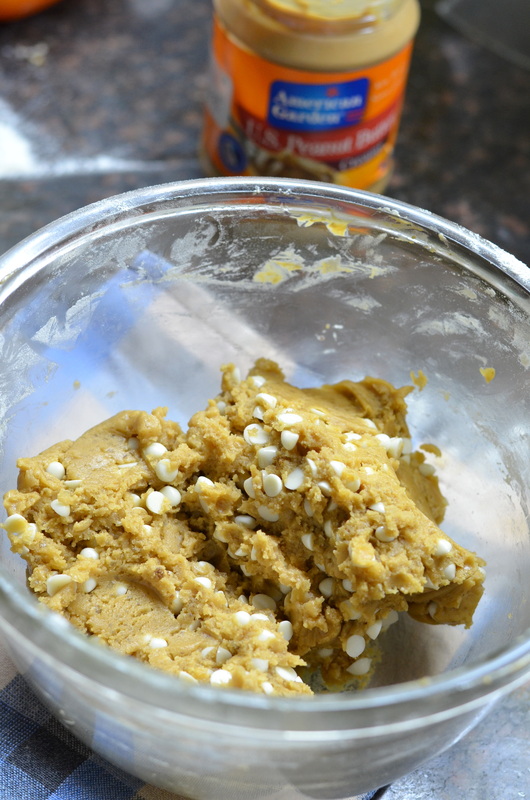 Whisk until the sugars and butter are properly combined, about 3-4 minutes and add in the peanut butter and egg. Whisk again until the mixture is light and fluffy. Add in the vanilla essence. Add the dry ingredients to these wet ingredients until everything is properly combined and you have formed a dough. DO NOT OVERMIX. 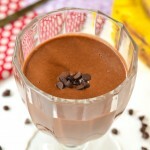 Add in the chocolate chips and mix to evenly distribute them. This is how your dough should look like. Wrap the cookie dough in a cling film or plastic wrap and chill in the refrigerator for 1 hour. After 1 hour, Preheat your oven to 180 degrees Celsius for 5 minutes while you prepare your cookies. Line a baking tray with foil or parchment paper. Take 1 tablespoon of cookie dough in your hand, make a ball of it and flatten slightly. Do that to the entire cookie dough and line all the cookies on the baking tray (keep a distance of about 2 inches between each cookie). 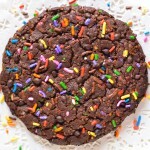 You might not be able to fit all of them at once so bake in batches. Make sure you keep the remaining dough in the refrigerator while the first batch is baking. Bake for 11 minutes at 180 degrees Celsius or until the sides have browned very lightly. They will look undone and will be super soft but will harden a little as they cool. Let the cookies cool completely before lifting them from the baking tray. They’re fragile when hot. Store them in an airtight container for about 1 week. Are you a peanut butter fan? 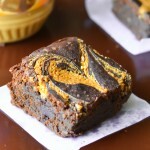 Try my extra fudgy Eggless Peanut butter Swirl Brownies. 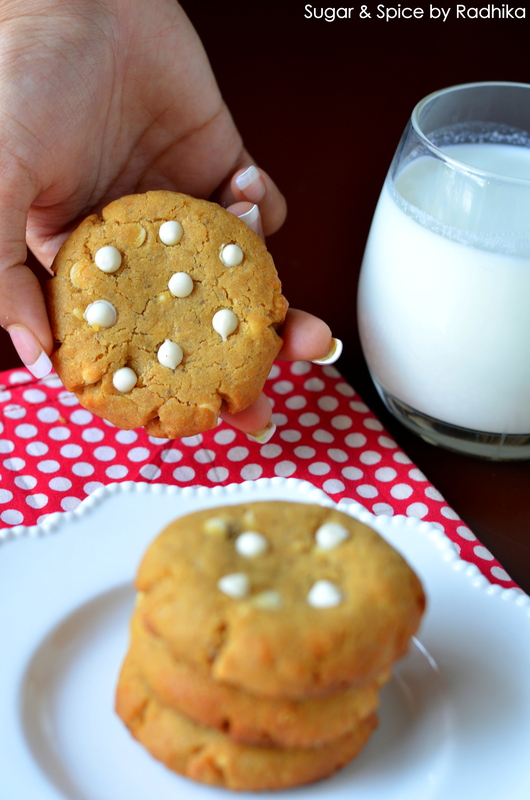 i love white choc chips. they look great! 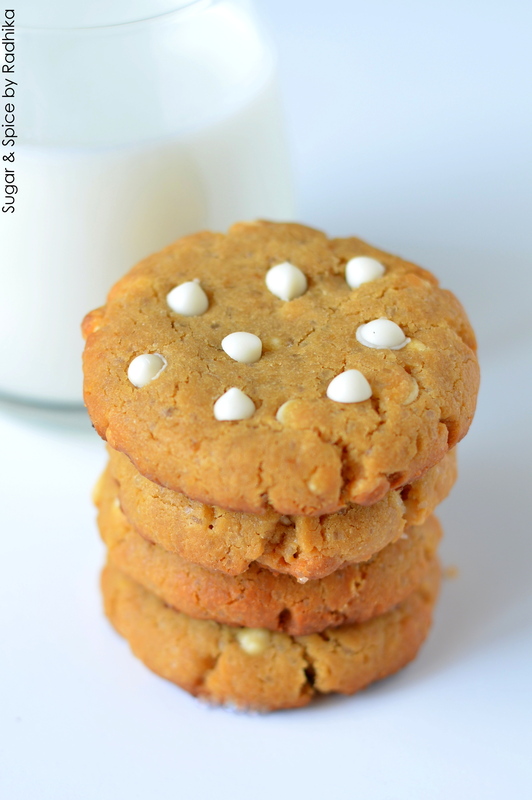 I always like cookie recipes, and combining peanut butter with white chocolate is a good idea! 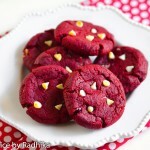 Wow.. these cookies look great.. I love peanut butter.. I usually pair crunchy peanut butter(i like that extra crunch) and dark chocolate.. peanut butter with white chocolate looks very interesting.. will definitely try this combination..
Those look and sounds delicious! Yum!